Although the development of advanced technology pays the way for the outburst of several e-commerce enterprises, these online merchants have to face the risk of being attacked by malicious nerds. The attack of bad hackers can causes serious damages to the activities of any company such as financial losses, leaked information, and decreased reputation. With the aim to help business doers handle this perennial problem, our Security extension for Magento 2 is introduced. Among various highlighted features offered, this extension stands out with file change detection function. What is file change detection? File change detection functions to create instant records concerning any changes made on a daily basis. All these changes are recorded when there is a file created, changed, or deleted within a store. Every day, all files of the store will be scanned at 00:00 to form a log of changes and send a warning email to shop owners at the same time. With this function, every change even the smallest one is also detected to inform store owners. Therefore, management process is much easier for business owners to keep track of all activities within their stores. Beside checking all activities related to file changes, Security extension also enables store admins to manage all login attempts within the store via Action Log in the backend. Explore. First, admins have to start from Admin Panel, then go to System > Security > File Change Log. After that, a grid will be shown with a list of activities done with each file. In the grid, there are several contributing elements, namely ID, File Name, Path, Type, Time and Action. From Type column, store admins can get to know the status of each file such as modified, created, or deleted. From the action column, clicking on View button can switch admins to a page with more detailed information about a specific file. Because the result is last updated since 00:00, if shop owners to update the newest activities, they can press on Check File Change button to get the most up-to-date actions done with all files. In case, there is a bundle of activities have been recorded that overwhelms you a lot, you can select Clear Log to delete all previous activities in the past. 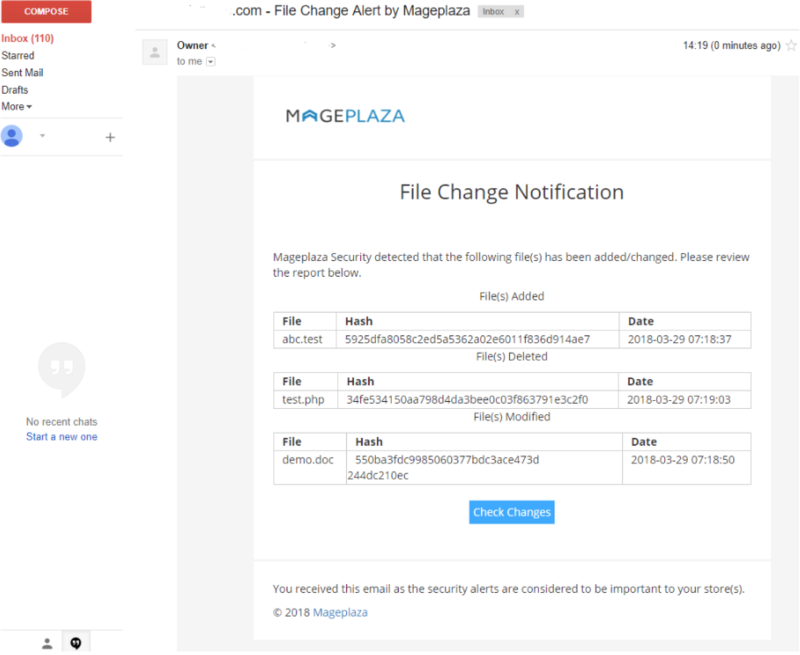 In file change detection function, along with the grid in the backend of a store is sending warning email to store owners. If there are any changes made with any files within the store, an email will be sent to shop owners to inform them of those changes. 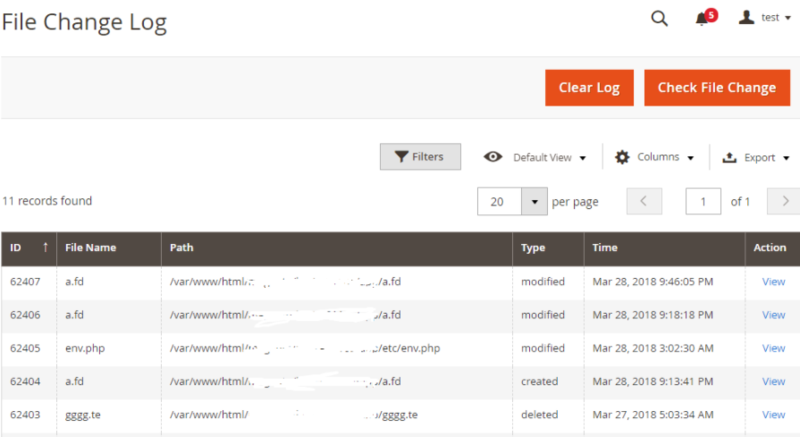 Therefore, store admins can easily keep an eye on the security of their files. Besides, in this email, there will be a button Check Changes to quickly switch store owners to their store’s management page.